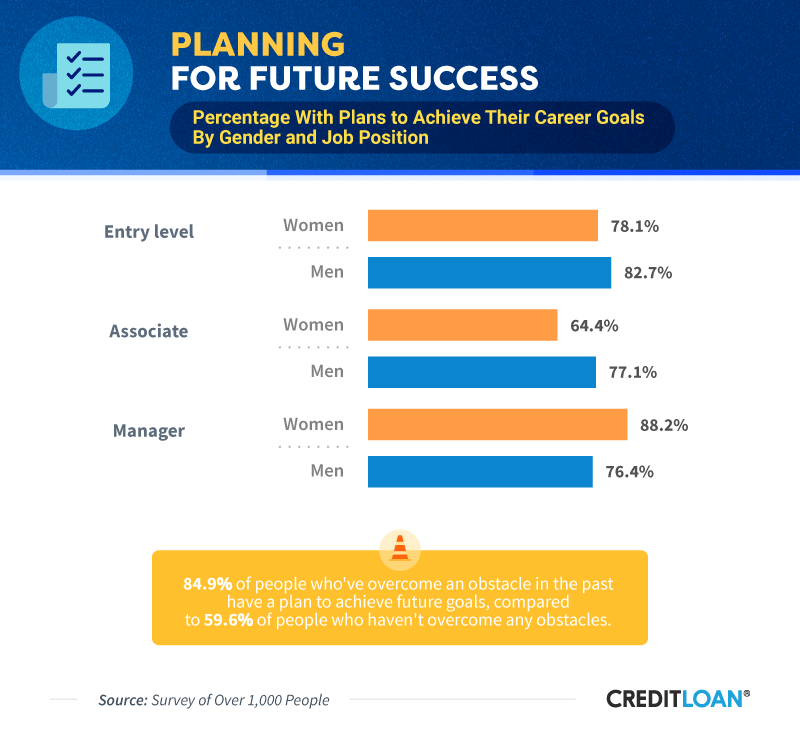 We surveyed 1,000 people to discover what they want in their careers and how they’re planning to overcome obstacles to achieve a brighter future. Think about your job. Is it your dream career? Do you wish you made more money, worked in a different industry, or had greater flexibility in your work day? If so, you aren’t alone. The unfortunate reality is many people aren't satisfied with their jobs. Some feel underpaid and overworked, others wish they could work from home. But just how many people want to see a change in how or where they work? We surveyed over 1,000 people to determine what obstacles are blocking their dreams. The results might surprise you. The famous automaker Henry Ford might have said it best: "If money is your hope for independence, you will never have it." That may explain why more people, especially women, are placing a greater emphasis on flexibility, more time off, and other quality of life issues. 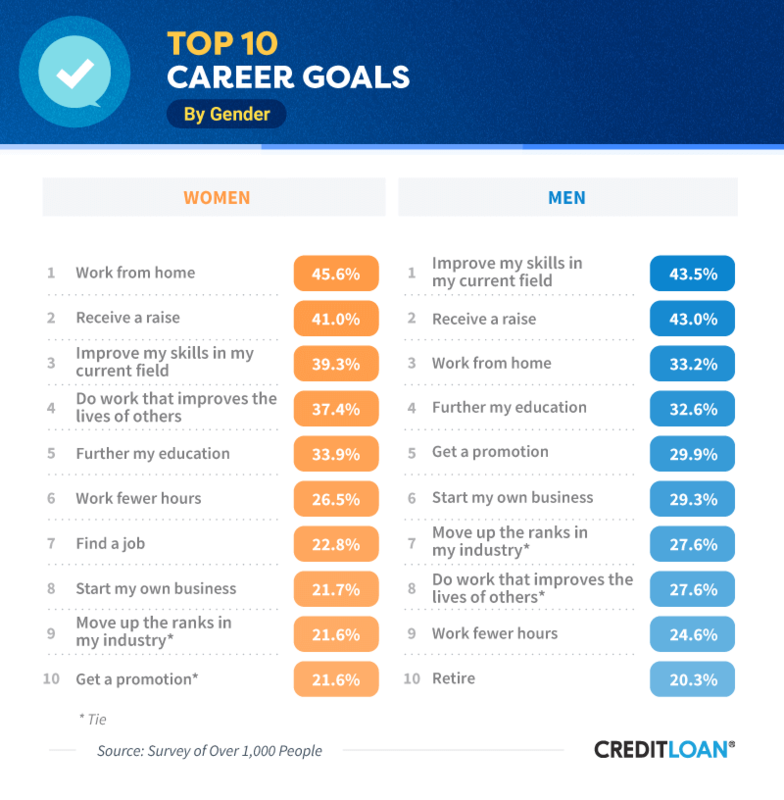 In the quest for turning dreams into reality, men and women differ in their top objective. Over 45% of women would like to work from home, while more than 43% of men want to improve their skills within their current field. Remote work opportunities often help employees balance career and home responsibilities, and learning or developing new skills is an excellent way to boost your income and invest further into your current company. In the last few years, many professionals from Fortune 500 corporations to small businesses have recognized that bridging the gender pay gap and giving women equal footing in the workplace should be a top priority. The Center for Creative Leadership surveyed more than 500 successful women and found paid time off and flexible schedules are desired by many. It's not that money isn't important, though, because 41% of women and 43% of men indicated that bringing home a more substantial paycheck was a top goal. An encouraging aspect for women is that while studies show those who worked full time earned around 80% of what men made in 2016, the difference is narrowing. One reason is more women are working, and female earnings are outpacing their male counterparts by over 1.1%. When it comes to defining career objectives, a couple of other issues also separate the genders. For those wanting their work to improve the lives of others, women excel in this category by almost 10 percentage points over men. Surveys also have shown women give nearly twice the amount to charity as men, even though most earn less. Another difference is how they view retirement. Just over 20% of men said slowing down is a career goal. Female respondents didn't place the same emphasis on retiring as men, with 21.6% focusing on moving up the corporate ladder or getting a promotion. That certainly doesn't mean women aren't concerned about their future. However, many financial planners say women are typically more cautious about retirement planning given the differences in earnings and lifestyle issues like health care and having to care for aging parents. They also tend to be more conservative with their investment allocations, which, in most cases, may be a wise move. If we asked people if they wanted a raise, most, if not all, would probably say "yes." But absent of action, wanting something usually doesn't translate into receiving something. Less than 25% ofmen and womenwho said getting a raise is a goal planned on asking their boss for more money. 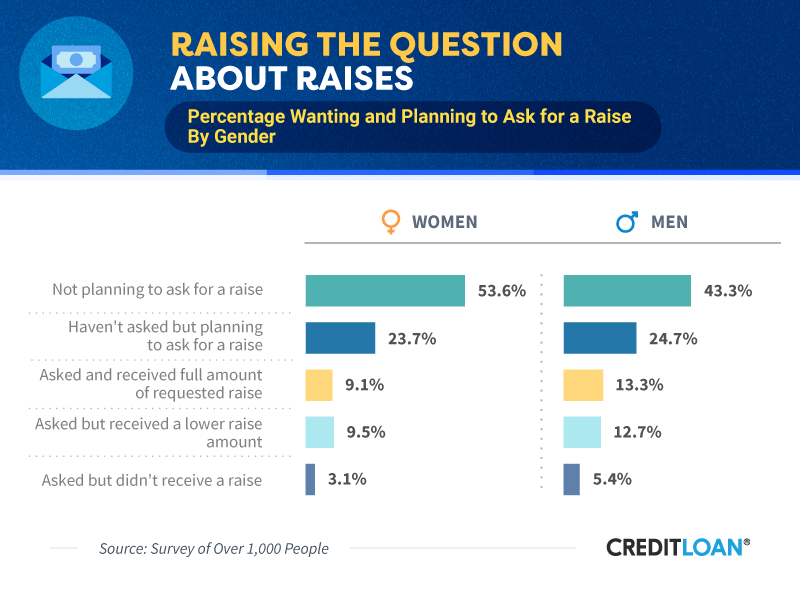 Would it surprise you to learn that 53.6% of women and 43.3% of men who desire more money have no plans to request a raise? Experts suggest your chances of receiving a raise increase if you follow some basic guidelines. For starters, make sure your performance is up to par. If employers see value in your work, your chances of a bigger payday will increase. And besides cash, other ways of improving your pay might be negotiating a flexible schedule, asking your employer to pay a more significant share of your health insurance premium, or even reducing your workweek from five to four days. Those who did muster up the nerve to ask for a raise didn't usually walk away empty-handed. For men, 13.3% who asked got what they requested, and another 12.7% received less than what they had in mind. Only 5.4% of men were denied entirely. One of our participants summed it up nicely. "Asking does not hurt," remarked a millennial male. "You need to state what you want if you are going to get it from a superior." The numbers aren't as good for women. Just over 9% who asked for a raise received the full amount, with 9.5% getting a smaller increase. About 3% faced outright rejection. Don't let these numbers dissuade you – employers admit most people aren't earning their maximum because they aren't asking. That's because only about 29% negotiated their salary for their current position, meaning 71% are most likely leaving money on the table. 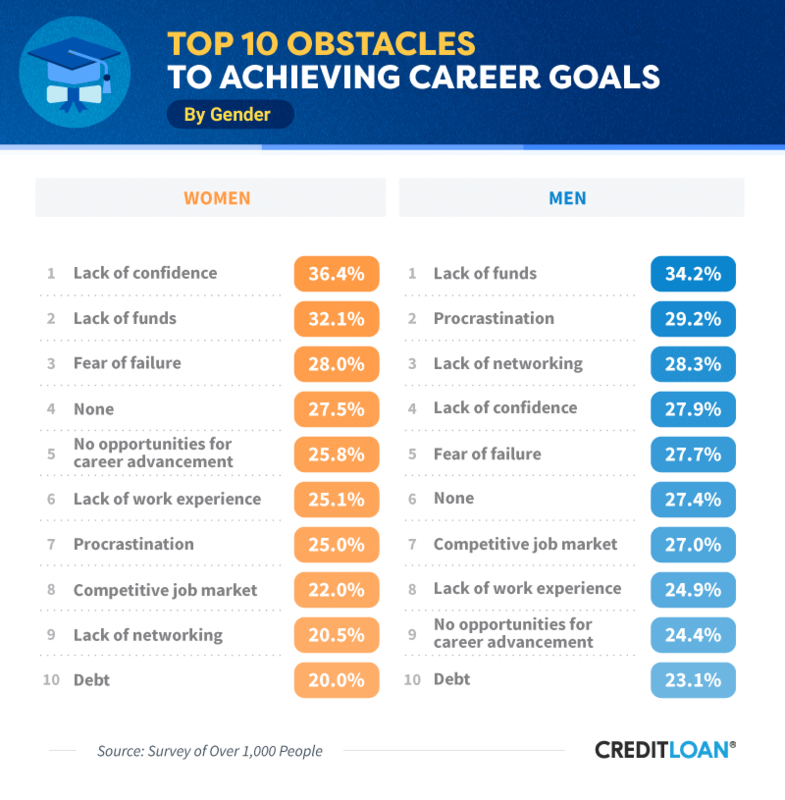 For roughly 28% of men and women in our survey, the obstacle keeping them from possibly achieving more in their careers is called atychiphobia, or the fear of failure. Psychologists have studied people's fears for decades, and they come in many forms. Some fear snakes or other creepy-looking animals. However, others might dive into a pit of reptiles to avoid having to speak or stand up in front of others. One way experts advise people to face their fears is by distinguishing between real and imagined threats. For example, a fear of speaking to large groups is an imagined threat because there is little to no chance that any harm will come to you. But walking into a pit of venomous snakes would prevent a real danger of death. Because your fear of failing is often more imagined than real, overcoming it might be possible by adopting new skills or thought processes, or by seeking advice from a qualified professional. Going a little deeper, 36.4% of women said confidence – or the lack thereof – was one of their career hurdles. For men, 34.2% said it was running out of money, also another top concern for women at just over 32%. Surprisingly, 28.3% of men saw their lack of networking as an obstacle, whereby only about 20% of women stated the same. Exercising their social and networking skills may be one way women can potentially close the gender pay gap. Both men and women, at 13% and 10.5% respectively, indicated mental health issues played a role in keeping them from reaching their dreams. Easy access to loans for students can either be a blessing or a curse. Forty-four million Americans now carry an estimated $1.5 trillion in student debt. 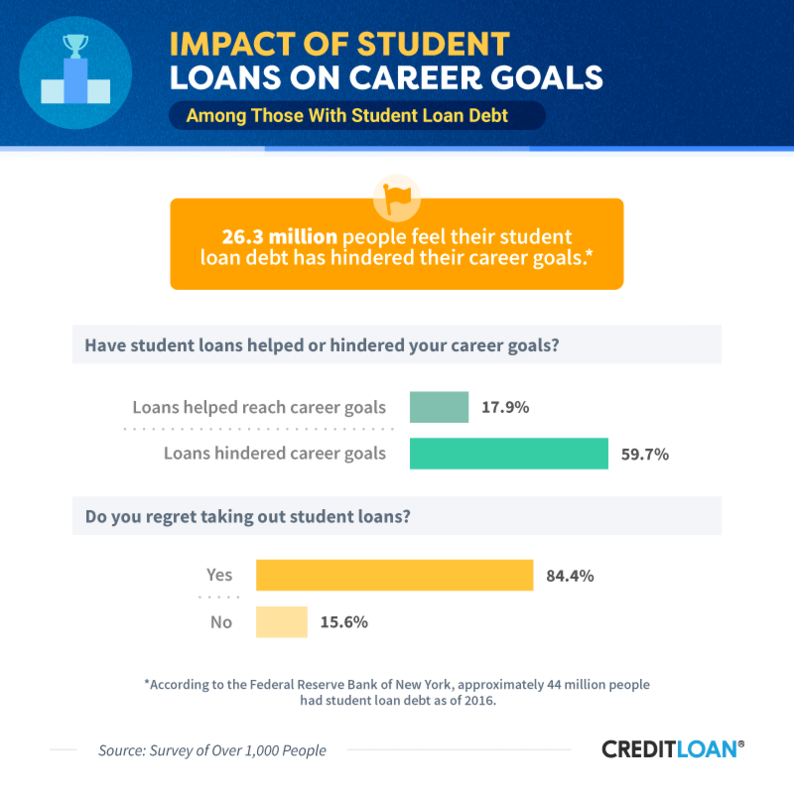 While student loans can provide the necessary funds to cover college tuition, books, or living expenses, nearly 60% of those we surveyed said their student loans have actually hindered their progress toward their goals. A whopping 84% said they regret taking student loans, so you may want to make sure you've exercised other financial options before applying for loans. One female surveyed who works in health care said she didn't regret taking student loans but advised students to make sure their potential income was enough to pay off the debt quickly. Even if parents can afford to cover tuition costs, some suggest taking student loans is still advantageous because it helps emphasize the importance of money management. Others suggest a more conservative approach, reminding borrowers that the real collateral for a student loan is your ability to repay principal and interest over time. Additionally, although the Trump administration is reviewing its policies on student loan bankruptcy, it is currently very difficult to discharge student loans in bankruptcy proceedings. Another man who borrowed money to cover a master's degree suggested people avoid prioritizing major purchases, such as a car or furniture, ahead of debt repayment. Your scout leader's advice on the benefits of preparation and planning before embarking on a hike or camping trip might also pay dividends later in life. Nearly everyone has some career goals, but the question is: Do you have a workable plan? The answer may lie in past experiences and where you are on the career ladder. That's because nearly 85% of those surveyed who have overcome prior obstacles are more likely to have a plan, versus the almost 60% who haven't yet overcome significant challenges. And planning is one area women could place more emphasis on. In entry- and associate-level work, women lag behind men in proper preparation. Going out on your own and exercising your entrepreneurial spirit is exciting – but also a big jump. Having a proper action plan might narrow the gap between success and failure. And kudos to women at the managerial level, as they lead men in planning by around 12 percentage points, 88% to 76%. Most anyone who has achieved success has faced a few hurdles along their journey. Call them what you want – challenges, situations, obstacles, or anything else – but the reality is that with planning, sound advice, and decisive action, you're much more likely to achieve your goals and dreams.Start by making short-term, easily achievable goals that will motivate you to keep moving forward. Powerful speaker and business strategist Tony Robbins once said, "Setting goals is the first step in turning the invisible into the visible." No matter how distant your dream may seem, each goal you set and accomplish will bring you one step closer to a new life. Whether you're aiming for more flexibility through the chance to work remotely or a complete career transition that allows you to help people in some capacity, we hope this insight will help prepare you for a brighter future. We surveyed 1,016 people using Amazon's Mechanical Turk. 49.8% of respondents were men, and 49.9% were women. Less than 0.5% were nonbinary. 42% of respondents were associate-level workers, 28.2% were entry-level workers, and 23.8% were executive, senior, or general managers. 59.1% had student loan debt. We weighted data to the 2016 U.S. census for gender and generation. 73.5% of those surveyed were currently employed on a salaried or hourly basis. 14.0% were self-employed. 8.6% were currently not employed. 3.4% were students, and less than 0.5% were military members. As of 2016, there were approximately 44.1 million Americans with student loan debt (Federal Reserve Bank of New York Consumer Credit Panel/Equifax). According to our study, 59.7% of respondents with student loan debt felt hindered by their debt. By applying this percentage to the total number of Americans with student loans, we approximated there may be 26.3 million Americans who feel hindered by their student loan debt. No statistical testing was performed, so the claims listed above are based on means alone. As such, this content is purely exploratory, and future research should approach this topic in a more rigorous way. Are you interested in helping others overcome their obstacles? We hope so and would be delighted if you want to use our data and findings as long as it's for noncommercial purposes. All we ask is that you give credit where it's due – to CreditLoan.com.